The SPS engine was mounted at the rear of the central tunnel, below the helium tanks. This was the one major engine in the Apollo system that had to be capable of being regularly restarted from the point of view of crew safety. Failure to operate at its first major firing to enter lunar orbit could be tolerated, because the spacecraft would loop behind the Moon and return to Earth's vicinity. Other engines could then restore a trajectory home. However, a spacecraft already in lunar orbit was completely dependent on the successful restarting of that engine to bring the crew home. With maximum reliability in mind, engineers endowed the engine with two of just about everything: two control systems, two sets of plumbing, two ways to pressurise the propellant tanks. In fact, except for the rather passive combustion chamber and bell, and the injector plate, the SPS engine was really two engines in one, with the crew having entirely separate control of either. Even pumps were banished from its systems in order to avoid having to rely on the moving parts that they contained. Instead, helium gas provided the pressure needed to push the propellants through the piping and into the combustion chamber with sufficient force. This helium was stored at extremely high pressure and passed through regulators which reduced its pressure to that required by the large propellant tanks. Reliability was further assured by the use of a hypergolic fuel and oxidiser combination. This meant that these substances - hydrazine as a fuel and nitrogen tetroxide as an oxidiser - merely had to mix to spontaneously ignite, unlike the engines on the Saturn V's three stages which required igniters to begin their conflagration. On the Apollo stack, every engine within the two spacecraft used these propellants. To start the SPS engine, one had only to open valves and permit these exotic propellants to spray into the combustion chamber through hundreds of holes across the face of the injector. As they met, they burned fiercely, generating an almost invisible but powerful flame. The engine valves could be operated manually by the crew via two prominent switches on their main console, or the computer could send a signal to achieve an automatic burn based on preloaded information and the results of its computations. Having been designed to operate in response to a wide range of command sources, sometimes, when faults afflicted its control systems, care had to be taken to ensure that it would not fire inadvertently. Soon after the crew of Apollo 15 had extracted their LM and were about to settle into their long coast to the Moon, its commander David Scott reported to mission control: "Okay; that all went fairly nominally, and the only different thing we've noticed is the SPS Thrust light is now on. And we don't know when it came on; somewhere in the process here.'' This light was meant to indicate that the SPS engine valves were open and that the engine ought therefore to be firing. The light was energised, although the engine clearly was not. "Roger. I understand the SPS Thrust light is on,'' checked Gordon Fullerton, the Capcom in Houston. "And all the switches are off," added Scott, ominously. 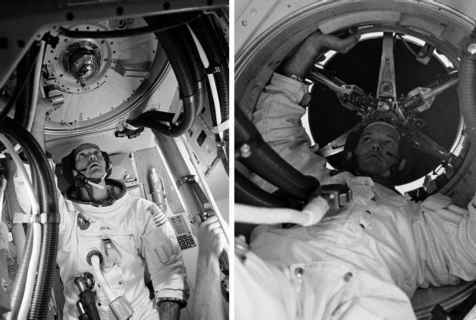 After an initial analysis, flight controllers asked the crew to open all the circuit breakers that could energise the engine's propellant valves. They realised that if electricity had reached that light, then it could also reach the valves and cause the engine to fire immediately the system was armed, rather than on command. Such an unplanned burn by a powerful engine would take them well away from their Moon-bound course and possibly put their safe return in jeopardy. Further careful diagnosis suggested that there was an electrical short in the vicinity of one of the manual switches for the SPS, which Scott confirmed the next day by slowly manipulating the suspected switch to see how the light came on. For the rest of the mission, the crew operated the SPS control circuitry with extra care, using the redundant system whenever possible in order to prevent an inadvertent firing. After the flight, when the spacecraft's anomalies were analysed, a tiny sliver of wire was found to have been trapped inside one of the manual switches for the SPS when it was manufactured. This was an occasion where the duplication of nearly every part of the engine allowed the faulty system to be isolated. The two separate halves of the engine's control and plumbing were termed the A and B banks. The Apollo 15 crew could start and end all their burns accurately using the good B bank, bringing the A bank in only during long burns when it was desirable for the engine to keep running should either bank fail. When both banks operated, more propellant reached the injector and the engine achieved a slightly higher thrust.